H.W. Whitley, who also helped develop Reseda, Van Nuys, and Hollywood, considered Whitley Heights his “crowning achievement.” Employing architect A.S. Barnes, Whitley sent him to tour and study the architecture and landscaping of the Mediterranean. Barnes designed the majority of the residences in Whitley Heights from 1918 to 1928, and recreated the ambiance of a Mediterranean village. The homes were designed so that each property could take advantage of the spectacular views. All power and telephone lines were buried underground so as not to interfere with the views. Hillside stairways were added to aid pedestrian movement. The beauty and seclusion of Whitley Heights’ architecture and terrain quickly made it the home of Hollywood’s elite: Rudolph Valentino, Tyrone Power, Gloria Swanson, Rosalind Russell, Judy Garland, and Marlene Dietrich all called it home. Unfortunately, the construction of the Hollywood Freeway divided the original layout of the neighborhood and destroyed many houses. However, the use of the Spanish Colonial Revival style in Whitley Heights led the way for the popularity of this architectural style throughout Los Angeles. Whitley Heights Historic District was added to the National Register of Historic Places in 1982. The neighborhood was designated as a Historic Preservation Overlay Zone by the City of Los Angeles in 1992. Today, the Whitley Heights Civic Association, formed in 1923, ensures the original concept remains viable. The Whitley Heights HPOZ Board, comprised of local stakeholders with expertise in building, architecture, preservation and real estate, meets on the 2nd and 4th Tuesday of each month, though meetings are canceled if there are no business items to discuss. Meetings take place at the Will & Ariel Durant Branch Los Angeles Public Library, at 7140 W. Sunset, Los Angeles, CA 90046. 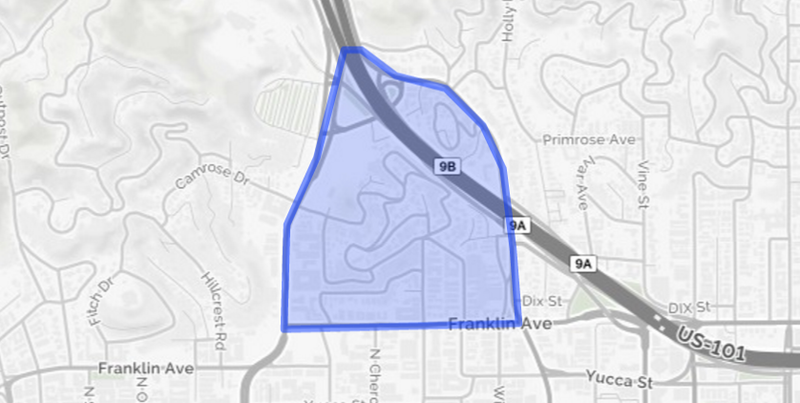 Location: in Hollywood, North of Franklin Avenue, West and South of Cahuenga Blvd and East of Highland Avenue. Falling in love with Whitley Heights?